I made these a few weeks ago for a dear friend who sits our dog. She is moving to another city and I wanted to give her a little handmade something. I remembered that peach is one of her favorite colors…I happened to have two orphaned balls of peach yarn…I love covered hangers…and thus a little project was born. I was familiar with this pattern because I had used it before, and so the hangers worked up quickly in a couple of evenings. I figured the yarn I had would make two hangers, and it turned out to be just exactly enough. 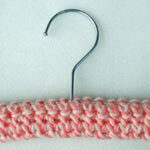 The pattern calls for Lily Sugar ‘n Cream Crafter’s Cotton, a size N hook, and a 25-chain foundation (+1 for turning). But I found that a strand of worsted and a strand of sport with a size I hook and a 42-chain foundation (+1 for turning) worked quite nicely. I think two strands of worsted would work well also. I didn’t count the number of rows I worked, but just kept going until it fit around the hanger. 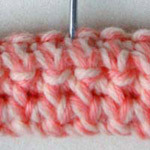 I really love this pattern because the stitches make a thick and sturdy little fabric, and it is easily adapted to many yarns. These look great! I’m thinking of doing something similar for Christmas presents (my dear great-aunt used to make them for the whole family and I thought I’d take up the tradition again) and I was wondering where you got the hanger. Thanks! I have searched (and had others searching) for the wooden hangers. Where can I purchase them? I have the yarn and hooks, but no hangers. I have even tried to use plastic hangers by splitting the bottom and pulling it up – didn’t work well at all.